Think French is an intermediate-level French audiomagazine that is published exclusively online. 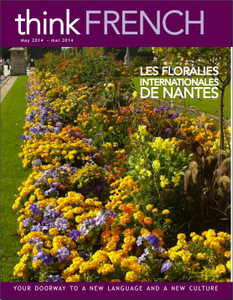 Each monthly issue contains eight 2-page features on a variety of subjects related to France and other francophone countries, including travel, history, news, culture, interviews, book and movie reviews, recipes, and idiomatic expressions. Every issue of Think French also includes a lesson and a listen-and-repeat exercise. Audio is provided for each article by several different native speakers, and all of the difficult words and phrases – many dozen per article – are bolded throughout the text and translated in a sidebar. Think French offers an assortment of interesting features to help you work on your French listening and reading comprehension in a fun and informative way. You can access it online, or download the PDFs and MP3s to your computer, tablet, or smartphone. Previous Quand le chat n’est pas là, les souris dansent !